The five GOP members of Iowa’s congressional delegation have consistently opposed proposals to strengthen regulations against guns including ones for stronger background checks. 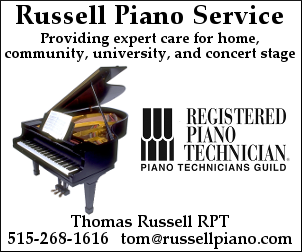 They have all earned “A” ratings (or “AQ” ratings, an equivalent rating based on questionnaire responses instead of votes) from the National Rifle Association, which has spent nearly $3.8 million to help them remain in Congress since the 2010 election cycle. On Monday, in the wake of a Sunday night massacre claiming at least 58 lives at a concert in Las Vegas — the worst mass shooting in US history — they offered thoughts and prayers to the victims and their families. Such condolences have become routine after deadly shootings but, thanks in large part to the aggressive lobbying by the NRA, rarely do the incidents result in meaningful policy changes gun control advocates want. Last year, after the Pulse nightclub massacre in Orlando that at the time was the worst mass shooting in the country’s history, senators attempted to pass legislation strengthening background checks but were unsuccessful in the charged election-year climate as efforts all failed along party lines. Sen. Chuck Grassley sponsored a Republican alternative to Democratic gun control bills that would have added money to the background check system and revised regulations against the mentally ill purchasing guns that Democrats and gun control advocates argued would loosen current restrictions. Since 2010, the NRA has spent $191,384 in support of Grassley. My prayers are with all of the victims in #LasVegas and their loved ones affected by this senseless act of violence. Joni Ernst, another reliable pro-gun senator, voted for the gun bill sponsored by Grassley in 2016. Along with Grassley, she supported a constitutional carry bill in 2015 that would have allowed gun owners to conceal guns across state lines. Ernst is one of Congress’ biggest recipients of NRA support in recent years — over $3.1 million. Most of that came when she first ran for the Senate in 2014, when the NRA dropped nearly $2.8 million in independent expenditures including TV ads targeting her Democratic rival, then-Congressman Bruce Braley. My thoughts and prayers are with the victims and their families and friends of the horrific and evil tragedy in Las Vegas. 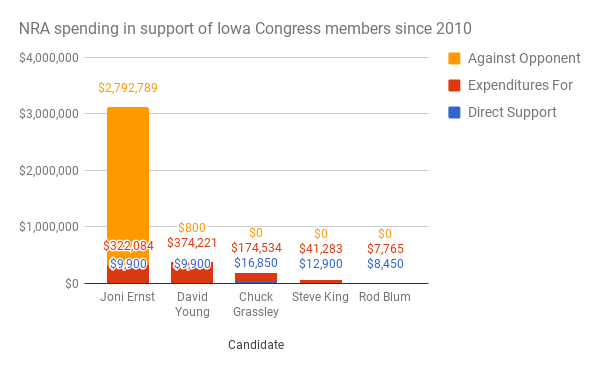 Congressman David Young, a former Grassley aide, has received $384,921 from the NRA since 2014 in the form of direct contributions and independent expenditures. Congressman Rod Blum, who’s received a more modest $16,215 in support from the NRA since 2014, tweeted a clip of President Trump’s response to the massacre instead of offering thoughts and prayers. The NRA was one of Trump’s biggest supporters; despite Trump’s claims that he ran a self-funded campaign, the NRA spent $30.3 million on his behalf. Hearts & prayers go out to victims & all affected by Las #Vegas #shooting. Thank you to all heroic law enforcement/medical first responders! Update: Congressman Steve King was slow to issue a statement on the Las Vegas massacre, but now he has offered his “Hearts & prayers” to the victims. He’s also a reliable ally of the NRA, which has given him $54,183 in direct and independent expenditure support since the 2012 election cycle.